Henry Moore’s iconic sculpture, Draped Seated Woman, is estimated to worth more than $26 million (USD). In order to pay debts, the now former Mayor of Tower Hamlets authorized the auction of the work which was created in 1957-1958. Purchased in 1962 by a Council that no longer exists, it was a gift to the residents of East London. Since 1997 the sculpture has been on loan to a sculpture garden in Yorkshire. Read more about how neighboring Council stepped in to bring this case to the courts, with support of many, including the sculptor’s daughter, Mary Moore. A London court has decided that Henry Moore‘s sculpture Draped Seated Woman, 1957-58 belongs to the council of the East London borough of Tower Hamlets. The ownership of the statue was called into question by the neighboring Bromley Council, after the disgraced former mayor of Tower Hamlets, Lutfur Rahman, announced his plans to sell the artwork at auction to combat government spending cuts. Now, the court has decided in favor of Tower Hamlets, where a new mayor now presides. 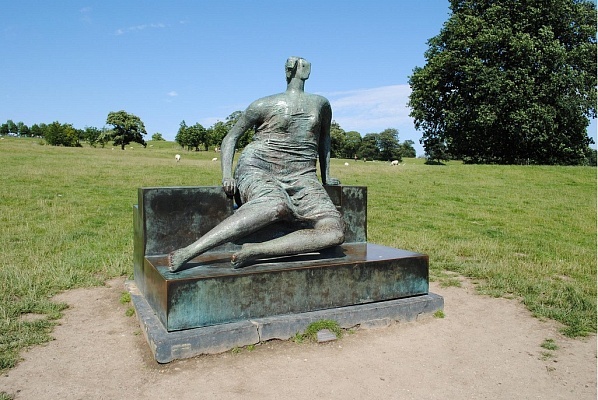 “I want to reiterate my intention to reverse the previous mayor’s decision to sell Henry Moore’s sculpture, Draped Seated Woman,” said John Biggs, the current mayor of Tower Hamlets. To get more details on how the sale was thwarted, read the original article. Thanks to Amah-Rose Abrams for this article.